A combo-box is an alternative to a selection list. The vertical list gets replaced by a single label with a button that opens a popup with the selection list, and the combo-box label shows the selected list item. // list item gets selected or unselected. std::cout << "Selected item #"
// this, and pass it. // immediate difference is the layout manager. // standard_comboboxlayoutmanager to initialize it. // list layout manager, like append_items(). // take an IN_THREAD parameter. // the message. Caveat emptor. // Same deal for insert_items(). // accessing the contents of the combo-box. // is for demonstration purposes only. // doesn't really do anything. // Use resort_items() to randomly shuffle the list items. // Stash the combobox in main_window's appdata. std::cout << "No combo-box selection." Passing a x::w::new_standard_comboboxlayoutmanager for the second parameter to a factory's create_focusable_container results in a container with a x::w::standard_comboboxlayoutmanager. This is the layout manager that manages the combo-box. 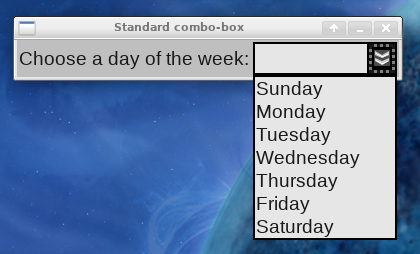 A standard combo-box consists of a popup with a vertical list of text labels. The combo-box itself consists of a label that receives input focus, and a button on its right. Clicking on the button opens the combo-box's popup with the combo-box's items. Selecting one of the items sets the combo-box label to the item's text. This is now the selected item. Selecting another item replaces the previously-selected item. x::w::standard_comboboxlayoutmanager is a subclass of the list layout manager, and inherits its append_items(), insert_items(), replace_items(), replace_all_items() and remove_item() methods. These methods modify the contents of the combo-box. combobox.C calls replace_all_items() in create_focusable_container()'s creator lambda to set the initial contents of the combo-box.